Watch How This Awesome Candy Vendor Entertains Bus Passengers! Most of the time, we normally witness those person who are selling chips, water, popcorn, and candies in the middle of any busy traffic roads. Often times, they are entering those big and fast buses just to market their products. People believe that any work that has a good intention and clear from any bad deeds are moral even it is the lowest job in our society. 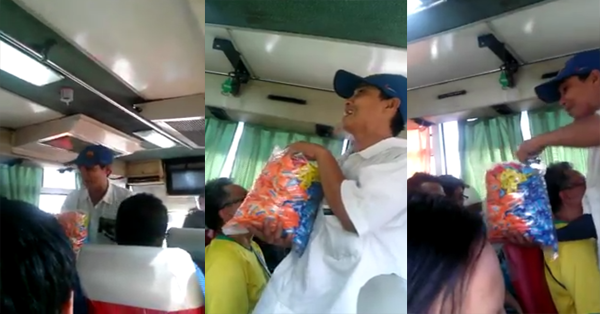 This vendor was selling candies inside any buses around the street with his own style in order to gain more attention fro his buyer. He was using his voice talent to captured everyone's ears. His voice is like the tone of the DJ's voice on the radio channels. Watch his video and be ready to be inspired. Amazing thing about it, despite from having those difficult and dangerous business, they still have the time to enjoy and play the way they wanted it to be. But it's actually effective to most people, especially those who are struggling for their problems. It something that could make you realize how we should be thankful to wait we have in life .